New plumbing in residential and commercial buildings, pipelines and distribution systems should be sanitized to kill bacteria when first put on line, or if repairs or service has been performed. Shock chlorination is one of the most popular methods for sanitizing pipelines. Chlorine’s powerful germicidal action eliminates slime bacteria, molds and algae. The threat of excessive microbial growth along the interior walls of drinking water distribution pipes is a major health concern of water distribution officials. Bio-fouling — the development of an organic bacterial community, also commonly known as bio-film — is composed of microorganisms and their secretions. It is present in almost every water distribution system, and when uncontrolled may present a threat to public health. Bio-films are layers of bacteria that attach to the interior walls of water distribution pipes and to one another — most heavily around corroded surfaces on pipes. The bacterial community traps nutrients, microbes, and waterborne pathogens to eventually form an almost impenetrable material. Almost immediately after attaching itself to pipeline walls, the organism begins building upon itself, adding layer upon layer, forming a plaque-like coating. It is extremely important that when a new pipeline or plumbing system is put in service or repaired, a thorough sanitizing and cleaning of the piping is done. 2. Testing of the residual to verify that the levels are present at the fixtures and hose bib or valves sections. If the chlorine residual is less than 10 ppm after 12 hours, repeat the entire procedure above. If the beginning dose is 50 to 100 ppm and the remaining residual after 12 hours is less than 10 ppm, this indicates severe bio-fouling or large amounts of dirt or slime present. Generally we don’t recommend this method, since it relies on introducing a slug or large amount of chlorine (usually powdered bleach or tablets) into one section of the pipeline, and hoping that this concentrated dose will properly sanitize the downstream sections. This is unreliable, and does not introduce a consistent, evenly distributed chlorine residual of 50 to 200 ppm throughout the system. It allows diluted water with varying residual levels of chlorine to flush through the system. It also can create very high levels of corrosive chlorine (over 500 ppm) which can damage fixtures and corrode copper and stainless steel. Professional water treatment specialists and distribution system operators typically use this method. The procedure involves leaving the water system or pipeline under pressure and using a high pressure, low-volume metering pump to inject a concentrated chlorine solution while the water is flowing at a given flow rate. After a chlorine residual of 50 to 100 ppm is detected at each faucet or fixture (using a high-range chlorine test kit) the chlorine solution is allowed to remain in the pipes for 12 to 24 hours. 1. Shut off the main line. Identify an outside hose bib or other opening in the incoming piping, on the customer side of the main valve. If a back-flow prevention valve is present, these can be utilized, as there is typically a ¼” FPT port available. If no hose bib or opening exists, install a ¼” or ½” threaded opening into the main line to use for injecting the chlorine solution. 2. Hook up a metering pump to the line (in our example, a 24 gallon/day output metering pump is used), using a injection check valve so the water cannot back-feed into the metering pump. If metering pump has a different output, adjust speed of pump or solution strength. In this procedure, a concentrated chlorine residual will be injected while the pipes are under line pressure from the street or city-water system, so a check valve is used on tubing leading to the piping, to prevent the water from backing up into the metering pump. 3. Make sure to use a metering pump that can develop pressures higher than the line pressure you are injecting into. 4. Determine flow rate. Open up the faucets hot and cold and read the water meter to determine gallons per minute. Output of pump is 24 gallons per day. 6. Run the water in the building, or at a valve or hose bib downstream until the bleach solution has filled all the pipes and a strong odor of chlorine is coming from the fixtures or faucets, both hot and cold. 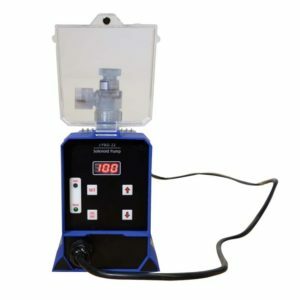 For best results, test the water at each fixture to verify that there is at least a 50 to 100 ppm chlorine residual, using a DPD method test kit. 7. Allow the water to sit for 12 hours. 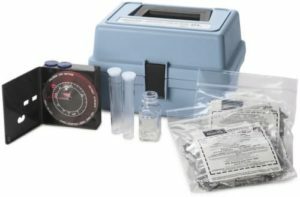 Retest for chlorine residual with a high range chlorine test kit: visit our test kit page. 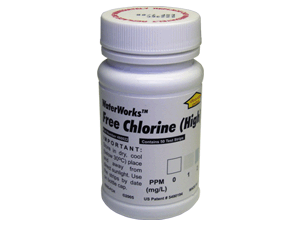 If the water contains less than 10 ppm of chlorine, repeat entire procedure. The slime, scale, and odor-producing bacteria will interact with the chlorine and reduce the amount of chlorine residual in the piping. If it uses up all the chlorine, or the chlorine residual is less than 10 ppm, then the procedure may need to be repeated. 8. Flush the piping and fixtures well to flush out scale and colored from water from the piping. Unscrew aerators and fixtures to avoid these items becoming plugged with sediment that may have been loosened in the chlorination process. 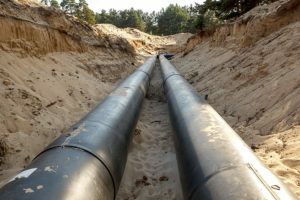 Caution: If the shock-chlorination procedure is being done on an old pipeline, or one that has accumulated scale or buildup, the procedure can loosen up scale, iron deposits and other materials in the piping, which can clog fixtures, appliances and valves in the piping system, causing a lot of problems. Care should be taken when flushing the piping, and all aerators removed to prevent clogging. In some extreme cases of corroded piping, the piping could fail and start to leak after this procedure. Figure 2: Typical metering pump and solution tank installation showing injection valve in piping, using a LMI brand metering pump.